Reptile tanks need a thorough weekly or biweekly cleaning, in addition to the daily maintenance of removing feces and uneaten food. In such a confined environment, pathogens can build up and pose a hazard to you and your pet. The exact cleaning procedure you should follow depends on what species of reptile you own, but the following instructions apply to most terrestrial reptiles. Semi-aquatic reptiles, such as turtles, also need regular water changes and algae removal from their tank. Put on rubber gloves and goggles. Remove your reptile and place it in another tank in another room. Unplug lighting and heating equipment. Remove all accessories, such as rocks and branches. Empty the substrate (if it's disposable) into a trash bag. Wash sand or gravel in a bowl with hot water and a few squirts of dish washing liquid. Rinse thoroughly and spread it out on a tray to dry. To make the sand or gravel dry faster, heat it in the oven at 200 degrees for about 30 minutes. Heating it will also disinfect it. Use paper towels to wipe away any traces of urine or feces remaining in the tank and discard the dirty paper towels. Make a solution in a bucket of one part household bleach to 16 parts of hot water. Alternatively, use a spray cleaner designed for reptile tanks. Scrub the sides, bottom and top of the tank. Use a barely damp sponge on the top of the tank. Wipe the main part of the tank several times with sponges soaked in fresh water to remove all traces of the cleaning solution. Wipe down the tank with dry paper towels then let it air out until it's completely dry. Any remaining traces of the cleaning solution could harm your pet if inhaled. Wash all accessories, including food and drink bowls, with the cleaning solution and rinse them thoroughly. Replace the substrate and accessories once they are dry and cool and turn on the heating and lighting equipment. Reintroduce your reptile to the tank. 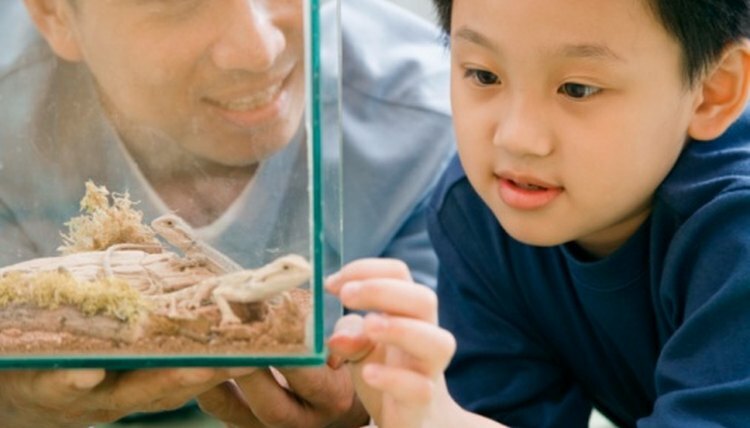 If you have sensitive reptiles, you may need to warm up the tank before reintroducing them to it. Never use cleaning products containing phenol (pine scent), which is toxic to reptiles. Do not allow young children, the elderly or the infirm to clean reptile tanks. Thoroughly wash your hands after each time you touch your reptile or the tank. Never use any of the equipment used to clean your reptile cage for any other purpose. How Often Should You Clean a Boa Constrictor's Cage?